It had been three years since we had slept. Slight exaggeration, but not by much. Our son had held a reign of terror at night time since he was a month old. Despite my close reading of Healthy Sleep Habits, Happy Child by Dr. Weissbluth (the sleep bible that everyone tells you to get if you mention your baby’s sleep issues) when my son was a newborn, his severe reflux and food allergy issues kept us from instilling those “habits” early on. Despite later sleep training (yes, the controversial — but not really — cry it out), followed by some good weeks or months of sleep once we learned the real reason he (or any baby) wouldn’t sleep through the night. Despite help from our pediatrician and from sleep consultants. Despite my purchase of every sleep book published in the last 20 years. Despite ill-fated attempts at co-sleeping. Despite all of this, we always ended up back at square one. Constant ear infections, other viruses, travel, anything! would eliminate any progress. And we still hadn’t met the Mother of All Toddler Sleep Destroyers: the transition from the crib to the toddler bed. That fateful evening started out as a normal night. After a bedtime battle of average length, we thought our son was settling in to stay asleep. My husband and I were in our bedroom, discussing what we should pack for our trip to Florida in a few days. Then we heard it. Thud. We looked at each other in horror. He had climbed out of the crib for the first time. Seconds later a very small boy dashed into our room with a huge smile on his face, delighted by what he had discovered he could do. And do again and again. That night we made a panicked crib to bed transition. My husband got out his tool box and took down the crib. From that day on, things became unbearable. He would not stay in the crib. Eventually we took to sitting with him in a chair in his room until he fell deeply asleep. Every time he woke up — sometimes several times per night — that process would need to be repeated. My husband or I would spend long portions of the night asleep ourselves (uncomfortably) in that chair. And to top it off the misery, he was now completely refusing to nap during the day. Eventually, I contacted Alanna McGinn, a pediatric sleep coach and owner of the Good Night Sleep Site. I had met her online, when she had given me a few helpful sleep suggestions on my Facebook page. My husband, son, and I couldn’t function like this indefinitely, particularly since I was now in my first trimester of pregnancy and desperately tired and sick from those early weeks. Because my son was so resistant to falling asleep on his own, alone in his room, she developed a plan that involved one of us sitting in a chair in the room and gradually moving further and further away from his bed. We tried that, and we made a little progress. Until the dreaded hand foot and mouth disease. For several nights he was up, screaming in pain from the huge sores in his mouth, dozens of times per night. After the illness was over, things were once again worse than before. Bedtime might take hours. He might spend hours of the night, wide awake with us in his room. This time we followed Alanna’s quicker approach. We got a gate (and then a lock for his door). On that first night, we explained what was happening to our son, that the gate was there to help him to sleep better on his own. We again showed him how his new toddler sleep clock works. We went through his normal bedtime routine. And then locked him in. We established non-negotiable limits: he was staying in his room and we were not. End of story. We did gradual checks — first at three minutes, then five, and then seven and so on. He fell asleep after about an hour of intense screaming. The next night it was closer to a half an hour. The next night it was ten minutes. And then soon he wasn’t crying at all. Let me tell you: It is bliss. It is life-changing. It is a miracle. He’s still not napping. But that’s okay. We’ll take it. 1. Don’t put off what needs to be done. There will always be an excuse for why you should put off teaching your baby or kid better sleep habits: He’s getting over a cold. He’s had a bad week at preschool. Your mother-in-law will be visiting soon. It’s almost the holidays. In my experience, sleep problems don’t just magically disappear. Your child will keep waking up all night until you tackle the real issue that’s keeping him from sleep through the night. 2. More gradual and “gentler” approaches can be often harder on everyone. It took us a while to learn this one. For many parents (particularly moms) first facing sleep challenges, their main goal — other than to get their kid to sleep — is to prevent crying. Even though I knew the unequivocal research that a few nights of crying will do absolutely nothing to hurt a kid’s development or his attachment to his caregivers, the thought of listening to my son scream made me crazy. So I often opted first for the “gentler” and gradual approach. And when it didn’t work or it stretched out all of our misery for weeks, we always ended up using more drastic methods. In short, it’s like the difference between ripping off a bandaid or trying to pull it off slowly, gently, and progressively. 3. Establish firm limits. One would think that after more than a decade and a half of teaching students from the elementary grades to college, I would be better at recognizing how crucial limit-setting is. Not the case. My own child’s whining, pleading, screaming, tantrums drives me to distraction, and I forget everything that I know about positive discipline, routines, and boundaries. For me, I’ve learned that I need to pick my battles, work on one or two areas at a time. Right now, sleep is one of them. As Tovah Klein, my new “Toddler Whisperer” and author of How Toddlers Thrive: What Parents Can Do Today for Children Ages 2-5 to Plant the Seeds of Lifelong Success , states, “Setting limits actually builds children’s trust.” Bedtime is now a comforting, predictable, and happy time for my son. 4. Get help. Don’t let months or years go by before you reach out to someone to get a fresh perspective about what’s going on. It’s easy to start thinking that no one will understand how difficult sleep challenges are, that everyone else’s kids are better sleepers than yours. It’s tempting to fall into the trap of thinking that you know your child best and no one else can help. You might even be embarrassed about how bad the situation has become. You might be frustrated about all the contradictory information in sleep books. Trust me. You’re not alone. Talk to your pediatrician. Reach out to your friends and relatives, and listen to their own stories. Join a Facebook group, like Alanna’s, and listen to other parents’ perspectives. This weekend my son started potty training. And now we’re onto another challenge…. 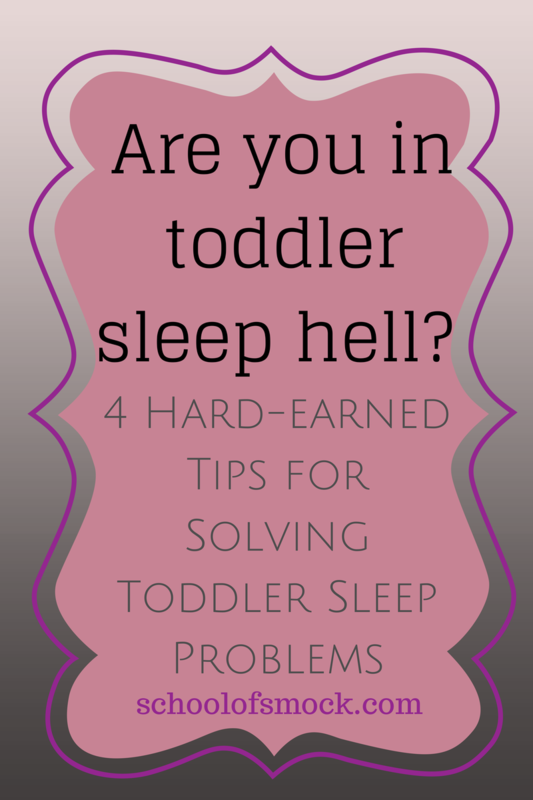 What’s been your biggest toddler sleep challenge? How did you handle it? What advice would you give other parents? I’ve raised 3 kids and had to let 2 of them cry it out. I recognized that it needed to be done in the first year of life while they’re still “confined to the crib.” Waited until 9mths with the 1st child (almost missed that window), and at 6 mths for the 2nd. We did “the process” — check them after 2 minutes, then 3-4 minutes, then 6-7 minutes, lengthening the time each time. The first night, it took close to 2 hours. The next night something like 20 minutes. By the 3rd night, 5 minutes. And then voila! Sleep for all. However, you are right that once they’re cribless, it’s a whole new ballgame. At which point, I turned to behavior modification charts (smiley charts). I’ve recommended this to other friends and it works quite well. A smile is entered on the chart each morning that the child didn’t come out of her/his room after lights out. There must be success early on so that the child realizes the merit of the smileys. A quick trip to the dollar store at the end of the week made my toddler happy. That’s IF you’re not prone to buying your child dollar store trinkets on a regular basis. It must be an “earned” reward. Good advice! I think my son is starting to get to the age where reward charts might work. For most kids, it’s definitely something to try once they reach 2.5 or 3 or so…. YES I AM. For SEVEN YEARS. None of our children are good at going to bed, staying in bed, OR sleeping through the night. Our first was 3.5 before he finally did. The other two – well, I’m hoping after trying some of these tips, I’ll be able to nip this in the bud shortly. The biggest problem we have now is the two little girls share a room. We just transitioned Tiny out of her crib (because she too learned how to climb out, even when we lowered the mattress to the ground!) But now she refuses to get in bed. We put up a gate, she crawled over it. I am ready to lock the door, but I hate to punish the 4 year old, but then again, she won’t go to bed either. She finds every reason in the world to come out. I just dread the thought of locking them both in. But it’s for the short term, with long term benefit, right? I’m in the same boat with my two boys… looking for answers of how to do it with two toddlers sharing a room.. Try the door monkey… The four year old can get out but toddler can’t. (Amazon sells it) I wasn’t able to get through the hysterical screaming tonight (hence the middle of the night web surfing) but am hoping we can use CIO to get a solid night of sleep for everyone now that we have this door contraption. It’s REALLY hard to let your baby girl cry when she is begging you and sobbing hysterically. 🙁 I wish there were another way to stop her waking me up every night! Oh, that’s so hard! I would strongly recommend starting with sleep at night before moving on to naps. Naps are MUCH harder. Wait to do naps until she’s falling asleep at bedtime on her own. Have you tried going into to check on her, gradually increasing the amount of time between each time? I think some kids find that comforting and don’t get as worked up. It’s so tough to do this alone! I’d advise you to keep your toddler in the crib as long as possible. The older they are the more control they have in a bed. Although, no guarantees…. Neither of my boys were naturally good sleepers. With our first, I was nearly driven to insanity with the lack of sleep. What worked for him (and us) was at 18 months, he was simultaneously weaned from breastfeeding, moved to his own bed (we were co-sleeping) and room, and it took a week of sitting with him/ waiting for him to fall asleep, before he finally slept through the night. He goes to bed happily now. With my second, we tried CIO but due to illnesses, travel, inconsistencies, it would work, then stop working, then work again. Finally when he was about 15 months old, we moved him into his brother’s room (with one side of the crib taken down) and he’s been sleeping awesome since. We have to do what we have to do with each child, and not one way works for everyone. 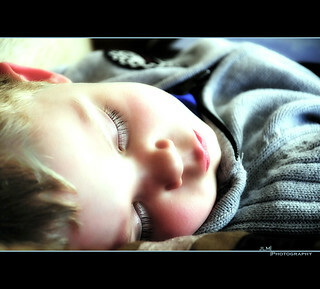 The important things are to cultivate good sleep habits early on, and that everyone gets sleep. How we get to it is less important. I’m glad to hear that things are going well for you, and good luck with the potty training! I think #2 is so true. In trying to spare feelings and spare tears, etc, we only end up with more problems for EVERYONE. Good job getting things to work better at nighttime. That can make a parent NUTS. Good lord, woman. I don’t know how you made it through all that. We had to do a (modified) Ferber-izing with our oldest, because she would NOT sleep by herself in her crib, only with us in our bed. It took about a week, and the first few nights were the hardest thing I have done as a parent. I hated every minute of it, but it paid off because she slept fine on her own from then on. Thank you! I have spent the past month fighting each night with my toddler to sleep. Gradual things do not seem to work for us either. I am hoping with some renewed grace and strength that I will be able to solve our issues over the next two weeks. My husband and I thank you. Our sweet baby who was always a good sleeper became a terrorist when we had to put her in a toddler bed. Two nights of this and she is already putting herself to sleep and making it through the night. So thank you. Are you just putting a gate across a doorway? Or closing the bedroom door? We put a baby gate. Modified as she can climb over it. How did you modify the gate? We are struggling with the same problem. He won’t even lay down like he is supposed to. We have been sitting in room with him but it still not working. Great post! Lived very much the same hell you did. Our solution has been to put a child-proof safety cover over the doorknob on the inside of the door of her room. At first, “locking” her in felt so mean, until we had blissful nights of sleep and then I overheard her showing the knob to her Grandma and saying, “see this, it helps me sleep!” I think taking away the temptation to get out of bed, helps them relax and go to sleep. “It’s nighttime. Get in your bed.” Our son screamed and cried for an hour. And finally stopped. I’m praying this works for us before we all truly go crazy! We’ve always had sleep issues with our first born who will be 2 in a couple of weeks. He transitioned (on his own) from a crib to a queen bed. The first few weeks were heaven! We have gates on so he can’t fall out, he fell asleep on his own with no issues. Then guess what? He figured out that he can get out of bed on his own and he’d much rather play or lay with us (when we’re trying to get household stuff done) than do that silly sleep thing. THEN….after we gave in and started laying with him to get him to sleep (which would take a good hour,) he’s all “oh, I’ll get out at night and come in their room!” So we decided no more of this silly bowing down to him nonsense. We tried cry it out with a gate across his door last night. After an hour of crying (and checking on him at intervals), I finally picked him up and held him for a couple of minutes (he was soaked in sweat from his excessive crying) and he fell asleep. We’ll try again tonight. I’m not expecting any miracles, but I’m going to keep at it. I find my nephew like that. He cries but won’t fall asleep. Cries and cries he’s a sweaty mess when I go check on him in small intavalls what should I do??? Vomiting. Wow. My suggestion would be to make sure not to feed or give drink too late. Not even bed time snack. If your children r used to bed time snack like mine. U will have to first get them used to no bed time snacks. That takes time. And crying. I think it took me a couple weeks. But they got over it and it’s best for their teeth anyways. Then once that is done and they are on a daily early eating track, then u can move onto bed time. Now if they attempt to throw up. It will be less mess. Quick wipe if needed and back to bed. Just take the vomiting as part of the crying. Children will do anything. I remember transitioning my oldest to a toddler bed.. AGH. being first kid – first time mom – I was of course excited for the next step. bad move! We went through that crazyness for a while and finally the gate thing along with leaving for 1 minute, then increasing time worked great. NOW she is 6, still scared to be alone – but listens because she understands she has to. Most of the time. However, her brother (age 2) – he goes to sleep okay, lots of warnings, and sometimes whimper cries because he gets told to go to sleep – but my issue is that he wakes up incessantly at night! I’m a single mom now, and when dad is around he listens SO well “Go back to bed Kai” and hes back in his bed, head on his pillow and quiet. But not for me! and more often than not its only me at bedtime. He has been getting adventurous and I know the climbing from the crib thing is coming soon and I will need to transition. I’m all for doing the firm limits thing… but how do I keep him from getting up if he wakes up at night… AND the firm limits thing is fine by me – but if Sister isn’t asleep (they share a room) he keeps her up and then we end up with a pretty crazy bedtime of everyone being irritated at each other. We’ve been having an issue with our 18 month old going to sleep on her own now. She was great before and would go down on her own from 6 to 14 months and then everything hit (first teeth, summer vacations, sickness, etc) and now she has to be rocked to a dead sleep before we put her in her crib. We tried the cry it out again but she screens like crazy and gets all hot and sweaty that I feel bad for our neighbors! I will try the quicker approach since the gentler ones haven’t helped lately! But my question is when you are doing your checks what are you doing? We have a video monitor so we can see what she’s doing but if we go into check on her or to calm her down it usually makes it worse! Are the checks just to see how your child is or are you comforting in anyway? Thank you! It’s pretty normal for a 4 month old to not sleep well. Definitely do not use the CIO method on an infant!! The gate idea worked well with my son. He would fall asleep on his own and I would leave the room, he then learnt to climb the gate back in April (he just turned 2) even now he will still not go to sleep unless I am there, lying in the dark with him from anything from 10 mins to nearly 2 hours, I have tried everything and am starting to lose the plot! This has been a very inciteful post site. I have a 3.5 year old who has been in a regular bed since she was 1.5. She has done pretty good for the most part with a few ups and downs. We used the gate for the first year or so and it worked great. We first put up the gate because we were scared she would get up and fall down the stairs. We have since taken the gate away(about 8-9 months and she did great). Now we have recently encountered a new problem. She is now coming out of her room several times a night, and most of the time crying/screaming. Is there anyone else experiencing this and do we put the gate back up or just continue trying to calm her and put her back in bed? She is potty trained (for the most part) and I don’t want to block her from the bathroom. Any advise out there? Has it gotten better? I would say keep returning her to her bed, as calmly and quietly as possible. Try to make it “all business.” Hopefully, she’ll begin to understand that night time is for sleep, not for getting up again and again. Using this method, how did you handle him waking at night? This post has helped this exhausted mom feel not so alone, thank you. Okay so my daughter is 27 months, she STILL wakes up two to three times a night. I try rocking her to sleep she’ll be asleep in her crib and about midnight she’ll wake up. I’ve let her cry it out, but she doesn’t stop. She also screams at the top of her lungs and it goes and goes. I don’t get it! What suggestions do yall have? And also is it normal that she has not tried to climb out of her crib? Do you rock her to sleep at bedtime? That’s the first thing that I’d try: stop rocking her to sleep and make sure that she’s awake when she’s put in her crib so that she puts HERSELF to sleep. When you said you put a gate on the door – was it a taller one that you could lock? Because a normal gate our son would just climb right over. We’ve been battling sleep problems fir the last year or so. It’s been so hard. I’m now almost 3 months pregnant and just know that I won’t be able to have 2 children in bed with me. My husband has moved to a downstairs bedroom because he just can’t sleep with our 3 year old in the bed too. I just don’t know what to do. He will not fall asleep without being cuddled or without his sippy cup. When he does fall asleep I will put him in his bed – but he usually only stays there for a couple hours, if that. Then he comes to bed with me. He moved a lot in his sleep and usually wakes up at least 2-3 times wanting his cup…..please help! I’ve been very sick and just so exhausted. Oh and he is an awesome temper tantrum thrower and screamer. I’ve tried to not give him his cup before and oh my gosh……let’s just say he ended up getting his cup…. My 2.5 year old son has been sleeping in a ‘big boy bed’ since he was a little over a year old and doing fabulously with it. Until a couple weeks ago. He’s also been throwing fits when getting dropped off at daycare – and then goes on to have a great day after we leave. Is this just boundary pushing? Should we let him cry it out? He’s stubborn and smart and I’m sure it will take a long chunk of crying but if that’s what it takes I’m up for it because this whole laying with him until he’s practically asleep thing isn’t working for me. We have the same problem with our younger son, two years old now – terrible crying at bedtime, sometimes in the middle of the night, and when he is entering the daycare. Untill a month ago, he went happily to bed, slept all night long and loved his daycare. I’ve tried everything, but after half hour of screaming, he is soaked wet, I have to pick him up and blowdry his hair, change his clothes and sheet… Also, if he cries in the middle of the night, he wakes up his 4 year old brother, and I have to take one of them to our room, or else nobody sleeps. It’s hell. Do you leave the door closed all night (gate up all night)? Also, when you check in what do you say? My daughter is 3 years old. We have tried calmly walking her back to her bed, but we do it for hours on end. We can not continue this. We have two year old twin boys and they started sleeping through the night by 3 months old! We thought we had it made until recently 🙁 one of our twins is constantly waking up between 2:30 and three almost every night and we have no idea how to break him if this. We don’t put him back into his own bed because of fear that he’ll wake his brother and we don’t bring him into bed with is so either my husband or I will sleep with him in the guest bedroom until he falls asleep. Then we’ll try to sneak out before he wakes up but most times we have to stay with him. Any advice on what we can do in this situation? Thanks!! My youngest just turned 2 last week. We moved her to her toddler bed after she learned to climb out of the crib. Hearing the thump the 1st time was scary. Occasionally, if she’s really exhausted, she’ll stay in her bed but at some point, she gets up and sleeps by the door. I guess I should be happy she’s sleeping but I wish she would sleep in her bed. Any advice or suggestions? They have very sensitive hearing, this is why they are sometimes startled awake by noises in and around the house. I think It is important to keep a routine and special nighttime indicators . I always try like Bath, drink, teeth and bed. If we go off sometimes my boy has a hard time falling asleep. I had my daughter days and nights mixed up and I wanted to get her on the right sleep schedule. I didn’t know what to do till I found this website. I’m trying to get the advantage of being soft on her. You’re welcome! So glad that it helped! Any tips on this at nap time? My 22 month old toddler goes to sleep independently at night and sleeps about 7:30pm-7am with no wake ups He used to go down for an afternoon nap the same way with no issues until recently. We are on 2 weeks of screaming for every nap. I have tried CIO but he will stand and scream in his crib for an hour plus He is clearly exhausted because he is falling asleep in the car anytime we drive anywhere on these days he refuses to nap. I am at a loss as I am seeing no progress with CIO, I have also offered to stay in the room if he will lay down quietly but that just results in him standing at the crib whimpering for me while I try to ignore him. I definitely think he is to young to give up naps, and I definitely think he still needs one. I need some advice! I sabotage my son sleeping in his own bed every single time he gets sick. I have an enormous fear of fevers, I watched my niece convulse in seizures due to a high fever, and ever since then I am a nervous nelly every time my son has one. So, he was a great sleeper in his bed then he got sick. I sleep very heavy so when he has a fever I like him near me so I can respond quicker if he wakes. He has had HFM 3 times in the last 2 months (thank you daycare) so now he’s just in our bed every night since I’ve created a monster. So I know what I have to do to get him back in his bed but what should I do when he’s sick? Do I just continue to bring him in my bed and then when healthy start the whole process over again, and then keep repeating the pattern? Hi. I have the same problem with my 2 years old daughter. Today is 4th day of this method, but I need some advice. When I put my daughter to the bed I stay outside and trying to explain: please go to the bed… on the evening time it’s working, but on the night not…if not talking to her she is going sleep on the floor. What I should to do… leave it her on the floor or put to the bed? Well this article saved my life and most likely my marriage. I hadn’t slept in three years and was on the verge of losing my mind. I used to have to sleep with my 3 yr old and 20 month old in their room until they fell asleep. Then they’d come in my room each at different times of night all night. We are a week in with the tips outlined above and there are hardly any tears anymore at bedtime and they sleep all night! My 3 yr old was pretty stuck in her ways so had a harder time adjusting but my 20 month old is doing quite well! They are in the same room and in the same bed (because the little one climbs in the older one’s bed) for now but that seems to work and everyone is sleeping!!! It’s a miracle! I made every last sleep mistake known to man and it was affecting my daily life in real ways. I read this article and went with it and am seeing great results. Thank you! That is just fantastic! That must have been so difficult with TWO toddlers with sleep problems. But you did it! I’m so happy for you! We are in toddler sleep H-E-double hockey sticks right now! My son is 27 months and we’ve sleep trained him three previous times using CIO. It was the only thing that worked- although it was agonizing!!! He had some terrible virus in his chest for 2.5 months…so much coughing at night. In the midst of that he figured out how to escape the crib. We had to transition to the toddler bed. Just as he’s getting used to that switch his two year molars rear their ugly heads!! He chewed through both of his wubbas (pacis) in a matter of 60 seconds!!! We had to throw them out. He’s also in speech for an expressive communication delay. Therefore he struggles telling us what’s bothering him and why. He threw his broken wubbas in the trash two weeks ago – replaced with silicone teethers. He sleep is still suffering at night. Fighting bedtime, waking and not being able to self soothe, screaming for me. When I eventually go in he will grab my arm and wrap himself around me like a vine. He will fall asleep like that. He will not let Daddy help!! Only screams for mama! I’m 21 weeks with baby #2 and am only getting 2-3 uninterrupted hours of sleep at a time. I’m totally losing it!! Any help – or just commiserations- will be greatly appreciated!! Oh, no! I’m so sorry! Is there a chance he’s still sick at all? Or teething again?